Senator James Hammond offered this speech as a rebuttal to those recently presented by Senators in oppositon to his perspective, questioning their argument that the Lecompton Constitutional Convention was a tool of the Territorial Government to maintain the dominance of proslavery policy. 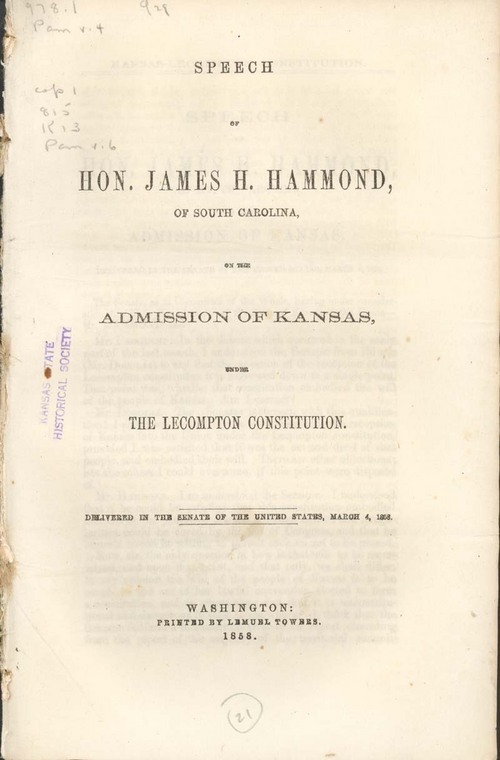 Hammond maintained instead that the Convention was "an assembly of the people in their highest sovereign capacity" and thus acted with the will of the majority of Kansas citizens. He also indicated that the South did not feel threated by the possibility of Kansas becoming a free state, as their exports and businesses were well off even without the increased foreign slave trade that Kansas potentially could bring.